Xamarin.Forms uses the native map APIs on each platform. 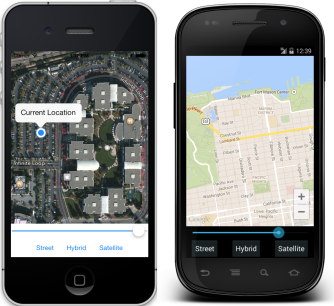 Xamarin.Forms.Maps uses the native map APIs on each platform. This provides a fast, familiar maps experience for users, but means that some configuration steps are needed to adhere to each platforms API requirements. Once configured, the Map control works just like any other Xamarin.Forms element in common code. The map control has been used in the MapsSample sample, which is shown below. Map functionality can be further enhanced by creating a map custom renderer. 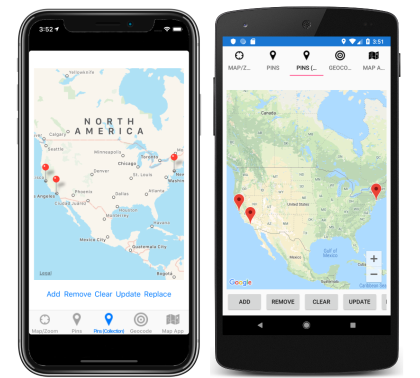 When adding maps to a Xamarin.Forms application, Xamarin.Forms.Maps is a separate NuGet package that you should add to every project in the solution. On Android, this also has a dependency on GooglePlayServices (another NuGet) which is downloaded automatically when you add Xamarin.Forms.Maps. iOS - AppDelegate.cs file, in the FinishedLaunching method. Android - MainActivity.cs file, in the OnCreate method. UWP - MainPage.xaml.cs file, in the MainPage constructor. Once the NuGet package has been added and the initialization method called inside each application, Xamarin.Forms.Maps APIs can be used in the common .NET Standard library project or Shared Project code. Additional configuration steps are required on some platforms before the map will display. Without a valid API key the maps control will display as a gray box on Android. Note that, in order for your APK to access Google Maps, you must include SHA-1 fingerprints and package names for every keystore (debug and release) that you use to sign your APK. For example, if you use one computer for debug and another computer for generating the release APK, you should include the SHA-1 certificate fingerprint from the debug keystore of the first computer and the SHA-1 certificate fingerprint from the release keystore of the second computer. Also remember to edit the key credentials if the app's Package Name changes. See obtaining a Google Maps API v2 key. The last two are required because applications require a network connection to download map data. Read about Android permissions to learn more. To use maps on the Universal Windows Platform you must generate an authorization token. For more information, see Request a maps authentication key on MSDN. The authentication token should then be specified in the FormsMaps.Init("AUTHORIZATION_TOKEN") method call, to authenticate the app with Bing Maps. The map content can also be changed by setting the MapType property, to show a regular street map (the default), satellite imagery or a combination of both. MapSpan.FromCenterAndRadius() - static method to create a span from a Position and specifying a Distance . new MapSpan () - constructor that uses a Position and the degrees of latitude and longitude to display. Locations can be marked on the map with Pin objects. Address = "custom detail info"
Maps can also be positioned in XAML layouts as shown in this snippet. An additional xmlns namespace definition is required to reference the Xamarin.Forms.Maps controls. The MapRegion and Pins can be set in code using the MyMap reference (or whatever the map is named). ItemsSource – specifies the collection of IEnumerable items to be displayed. ItemTemplate – specifies the DataTemplate to apply to each item in the collection of displayed items. The ItemsSource property data binds to the Locations property of the connected view model, which returns an ObservableCollection of Location objects, which is a custom type. Each Location object defines Address and Description properties, of type string, and a Position property, of type Position. The appearance of each item in the IEnumerable collection is defined by setting the ItemTemplate property to a DataTemplate that contains a Pin object that data binds to appropriate properties.